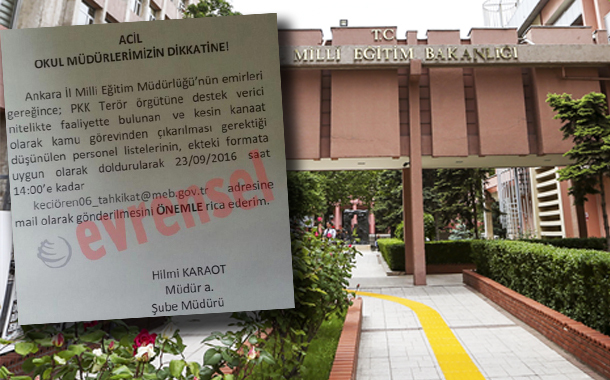 A recent circular from Turkey’s Education Ministry has asked school mayors to rat on teachers whom they consider affiliated with the outlawed PKK, implying at another wave of massive dismissals under emergency rules. “The list of the personnel who carry out activities supporting the PKK terror organization and of those who must be dismissed from civil service should be sent to kecioren06_tahkikat@meb.gov.tr until 14.00 on Sept. 23,” Hilmi Karaot, Director of National Education in Ankara’s Keçiören district stated. The circular was sent on behalf of Ankara Provincial Directorate of National Education, according to the circular published by Turkish daily, Evrensel. Karaot refused to comment on the circular stating that there was a misunderstanding, the daily reported. Under post-coup emergency rules, Turkey has sacked 27,715 teachers and suspended 9,465 others over their alleged links to PKK or the Gülen movement, which the government accuses of masterminding the coup attempt, since the July 15.